With my recent purchase of a thermal jacket and awesome thermal bib tights from Craft, I’ve become a lot more comfortable riding in colder temperatures. Matched with a balaclava and either thermal gloves or lobster mitts, I’m able to ride comfortably for hours at 20-40°. However, there’s always been one glaring problem with cold-weather rides: full-fingered gloves make it impossible to operate my new bike computer. Its capacitive touch-screen requires contact with skin to complete an electrical circuit to determine where the touch took place. Although not a critical issue, it was most pressing (pun intended) when relying on the computer for navigational cues. But the computer just won’t respond to fingers insulated (in both thermal and electrical senses) within full-fingered gloves. This difficulty first came up on the 3-2-1 Ride, a chilly century along the Great Allegheny Passage. Fortunately, being mostly on a bike path, the route didn’t require much navigational work. I easily made do by just bending down low over the handlebars and operating the touchscreen… with my nose! In later months I’d also work it by removing the computer from its handlebar mount, bringing it up to my face, and rubbing it against my nose. But after a few swipes, it became apparent that a nose just isn’t a particularly good stylus, and a smear of nose grease really detracts from a screen’s legibility. I considered buying some newfangled gloves with capacitive finger pads, but that seemed unnecessarily expensive, since both my sets of gloves are fairly new and otherwise work great. I looked into capacitive gel and dots that you could apply to the fingers, but those had pretty poor reviews. 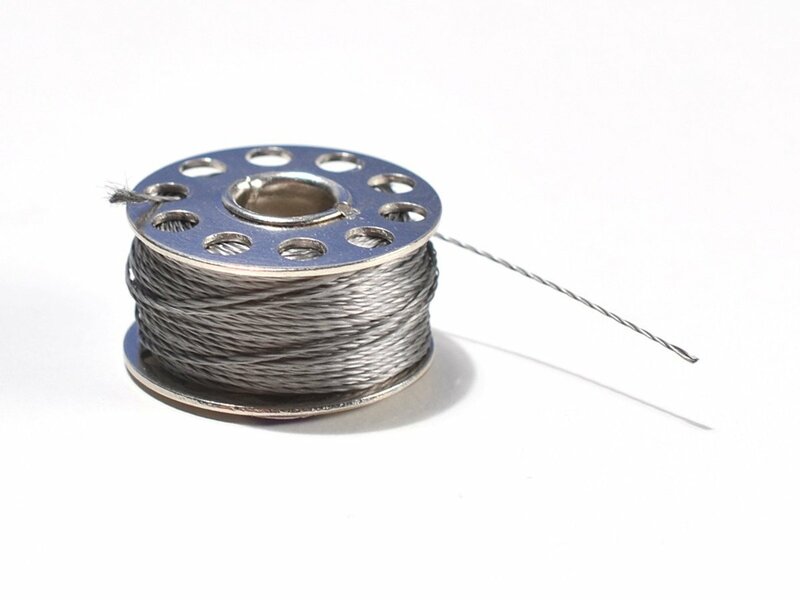 Finally, I decided to spend ten bucks on a bobbin of conductive stainless steel thread, sewing it through the fingertip of my full-fingered gloves, lobster mitts, and my non-cycling winter gloves. While it isn’t perfect, the conductive thread doesn’t work too badly, doing the trick more often than not. And that’s good enough, when the alternative is stopping and taking off one’s gloves in 17° weather! I’d generally recommend the thread. It’s not too heavy gauge, so it’s plenty flexible and easy to work with. And, of course, it works just as well with capacitive cell phone screens as it does with bike computers. However, there are a couple things to be aware of. There’s no need to be cheap here, so buy reputable thread. There are plenty of people out there selling fakes. Secondly, remember that the thread works by conducting the electrical charge from your body to the screen. Thus, you can’t just sew the outside surface of the glove; you have to go all the way through the material to the inside, ensuring that there’s a good contact with the flesh of your finger inside the glove as well as the screen. When the thread doesn’t work, it’s most likely because it’s not in solid contact with your finger. And although it’s pretty easy to work with, trying to manipulate a sewing needle in the tiny, narrow inside of a glove’s finger can be difficult. It doesn’t have to be the cleanest sewing job, but you want it to be both effective and at least a little durable, so take your time. Do that, and you can keep your gloves on and your fingers warm, and keep the nose-grease off your bike computer!